I had big plans for all I was going to do this past summer in the way of projects. Suddenly, it was half-way through July and I had very little, if anything, done. But, there’s always time for inspiration and so, while visiting my sister in Minneapolis, we wanted to explore City Salvage. Nicole Curtis of DIY Networks’s Rehab Addict shops there often for her vintage finds. As one of my favorite shows and personalities, I really wanted to make a visit while in town. However, are plans and toddlers didn’t allow us to get there, so it will have to wait until next time. If you haven’t seen the show on DIY Network…do it now! She’s amazing. We did manage to check out an enormous thrift store called Unique Thrift Store. This place was huuugge and was so organized! It had amazing stuff. 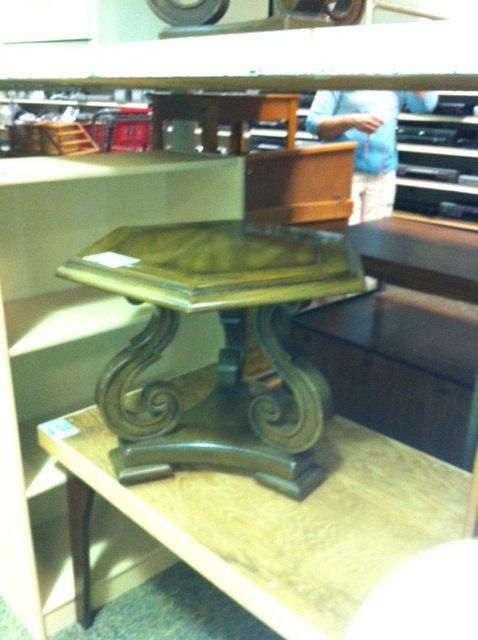 I found several items I’d have loved to take home and refurbish. One table caught my eye. We did find some things to do a small porch makeover for my sister (I’m embarrassed to say I have no pictures). It was fun just to go and look around and get some inspiration. Even if all the projects I want to get done don’t, it’s always fun to keep finding ideas! Where do you go to get inspiration and ideas?